Delhi : To pack a punch, Dilip Singh Rana or 'The Great Khali' is now playing from Aam Aadmi Party's side for upcoming Assembly Elections in Punjab. Alert! He has not joined the party, instead, he has extended unconditional support to Sajjan Singh Cheema, AAP candidate from Sultanpur Lodhi. 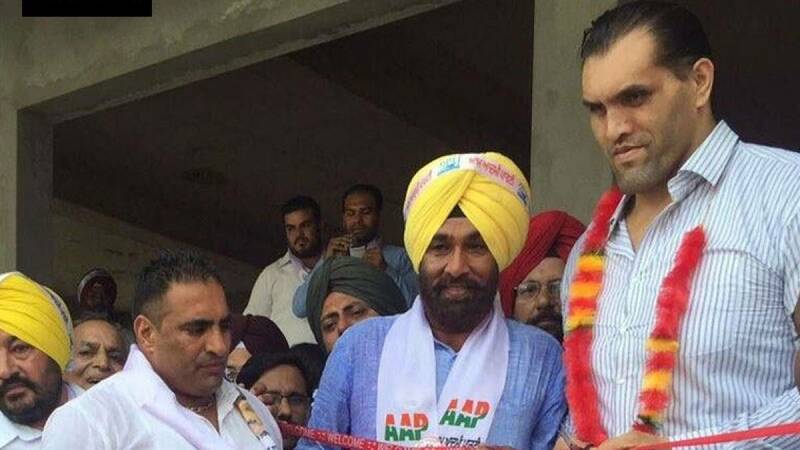 # Dalip Singh Rana or The Great Khali as he is known all over the globe after his successful stint at the World Wrestling Entertainment (WWE) is all set to campaign for Aam Aadmi Party in Punjab, party sources said. # First a news agency claimed that he has joined hands with Kejriwal's party for the upcoming elections but moments after they came out with the correction that he will only be lending unconditional support to one of their leaders. # Khali, one the tallest WWE wrestlers at 7 feet 3 inches and weighing 190 kg, was born and brought up in a small remote village in Sirmaur district in Himachal Pradesh, some 200 km from the capital Shimla. # Khali has also served as a police officer in Punjab before he went to make a mark in his wrestling career. Khali took to bodybuilding and won the Mr. India title in 1995 and 1996. He also acted in the Hollywood film The Longest Yard. # The Great Khali has also worked in Bollywood. His support to Aam Aadmi Party will definitely increase chances of the candidate to take a stronghold in the upcoming polls. # Punjab will go for Assembly Polls in 2017.